Experience the addictive gameplay of old-school arcade favorites, updated for the 21st century, with unique upgrades, player responsive difficulty, and a subtle system of tactics combined with classic gameplay. The last human in the universe has been slain by evil killer robots. As the last remaining humanoid battle droid, you'll be fighting through over 40 arcade levels to finally take on the four giant boss 'bots of the apocalypse. 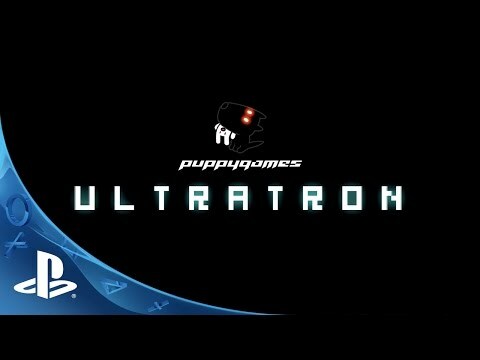 An arcade game on steroids, Ultratron combines risk-reward arena gameplay with an upgrade system, responsive difficulty, pet drones, special weapon abilities, and online leaderboards. (Two player drop-in co-op mode on the PS3™, PS4™ systems). This Cross-Buy product entitles you to download the PS3™ system, PS4™ system, and “PS Vita” system versions! Ultratron is a twin-stick arena shooter inspired by some of the best that classic arcade gaming has to offer, updated and improved for the 21st century. Ultratron ™ and © Puppygames. Licensed by Curve Digital.